The EUR 100 million contract covers the shipment of an estimated 4,000 European-procured high-technology components from their production location to the ITER site in France. During the fifth edition of the ITER Business Forum in Marseille, the European Domestic Agency concluded a major contract with the global group DAHER for the logistics and transport of European components for ITER. 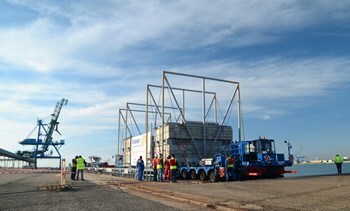 In February 2012, the ITER Organization had signed a global framework contract with DAHER on behalf of the ITER Domestic Agencies to facilitate the complex logistics related to the transport of ITER components from suppliers all over the globe to the ITER site. The framework agreement foresaw the conclusion of specific agreements, called Implementation Agreements, between each Domestic Agency and DAHER (or DAHER partners) nominated locally. Last week's signature was thus the conclusion of negotiations between DAHER and the European Domestic Agency for its specific transport needs. As host, Europe is also responsible for paying for DAHER services used by the other ITER Members to transfer their components on French soil, from Marseille's airport (Marignane) or the Fos-sur-Mer port to the ITER site. Read the full article on the European Domestic Agency website.